The Aviation Cocktail is a whole lotta effort for a gin and grapefruit juice. At least that's what it tastes like to me. In short, it never takes off depsite a whole lotta buzz. There's mucho hype, marketing, puffery, sick, cool and tasty on the web -- I never want you to think I'd hesitate to call something out for what it is. And when it's BS like this cocktail - - You're gonna hear about it here. I now have two bottles of useless liqueurs. 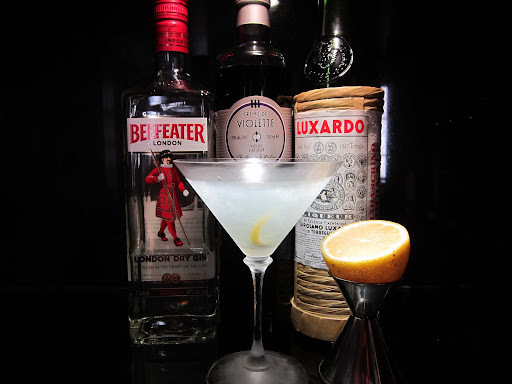 Creme de Violette and Luxardo Maraschino are taking up a lot space on a very small bar. The Italian Luxardo comes in straw and has a super cool label with the 1821 Trademark and all kinds of awards. Folks see this on your bar and they're gonna think, "Hey, this guy knows what he's doing." Of course, they would be wrong but the impression will only cost you $30 - That's not bad for an impression. The Creme de Violette is an ugly bottle with Art Decco pretensions. Rothman & Winter make this Violet liqueur in Austria. Maybe Hitler had this stuff on his bar up there on Eagle's Nest. It would certainly explain why he didn't drink. It really does taste like a flower and that ain't good. Not for me. I remember eating some flowers on a dare when I was 12 years old and getting very sick. Creme de Violette took me right back to up chucking in the back seat of the family station wagon while my two sisters laughed at me all the way from Columbia, SC to Charlotte, NC. Cherry and violette will be on my bar 'til I die most likely. I don't see this stuff getting much use and neither will this Turkey belt from Staffords. It does remind me of the WKRP in Cincinnati episode, Turkeys Away, where the radio station manager, Mr Carlson, drops live turkeys from a helicopter over the Pinewood shopping center. 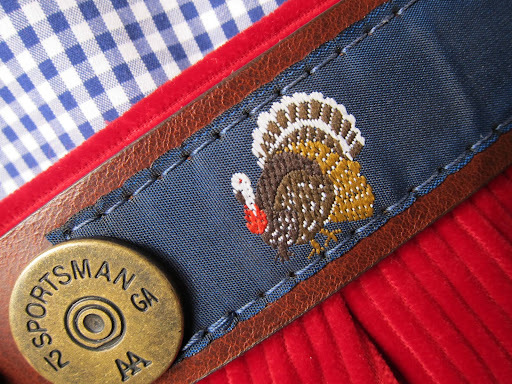 Add, "I Thought Turkeys Could Fly" onto this ribbon belt and you could really have something. I suspect this belt will be worn once a year. On July 4th for the only reason people will ask why I'm wearing a turkey belt on the 4th. And I'll tell them, "Because turkeys can't fly. Wanna cocktail that can?" Anyone who's been turkey hunting knows those big birds CAN indeed fly. C'mon, Tin. You went to school in Republica Hanging Chad. You should know this. The maraschino is in some champagne punch recipes (albeit in tiny measurements). So just throw a LOT of daytime summer parties. Stew- Wild, yes but that's not what Mr Carlson threw outta the helicopter at 2,000 feet. Anon- That helps. I like a summer party. I'd like to have one of those cocktails right now. "Cherry and violette will be on my bar 'til I die most likely"
Anyone here besides me know what a "Brummagem Joe" is? I do now. Joe, that's quite a handle you got there. Columbia, SC, huh? I grew up in that fine town and still spend holidays there. Family stationed at Ft. Jackson? Abacus- Nope, just visitin relatives. I did do basic at Jackson. Something to do with Birmingham? tintin, using the photo tip? the images are looking pristine. TinTin I love the turkey belt! Perfect for Thanksgiving Day Tailgating! "Anyone here besides me know what a "Brummagem Joe" is?" .....There is/was only one "Brummagem Joe" Chamberlain......a real piece of work as the length of his Wiki entry indicates but with great personal style and charisma which is suggested by the avatar pic.....I'm working on it! Anon 13:49 Yes. Your photo tip was bang on. Make use of the maraschino as a sub for chambord? Might be okay in a kir royal. 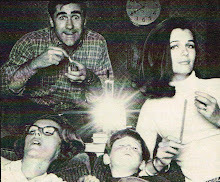 The pics are great - the turkey and corduroy pop nicely. Ewww, that creme de violette stuff sounds nasty. 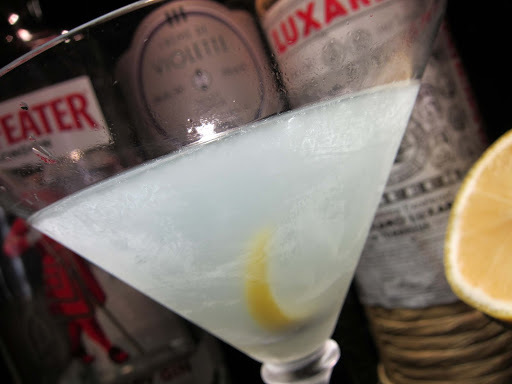 Why ruin perfectly good gin? Cathleen- I like a good Kir Royale or even just a Kir. I'll give yours a try. I'm a moron when it comes images and I have a lotta to learn but Anon's comment really helped. Mix with ice and strain into a cocktail glass. As for the Creme de Violette, I think you are stuck. John M, I've had one. Reminds me of a Manhattan. cg- You want me to introduce? a couple other drinks i looked up online that you may want to make. maybe you'll like them. maybe you won't. who knows? at any rate, you'll be ridding yourself of some of that creme de violette that you find so vile. both of these came from a simple search on a favorite cocktail website of mine. both of those are essentially modified martinis.